The tolerance zone protects buried utilities. The tolerance zone provides a buffer zone to prevent damage to underground utilities that could result from nearby excavation. 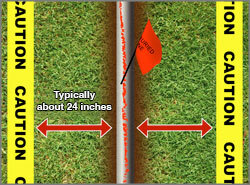 The tolerance zone is the width of an underground utility plus 24 inches on both sides of that utility. Do not use power-digging equipment within this zone. The tolerance zone also protects you. If you do not respect the tolerance zone, you risk contacting buried utilities. You also risk damaging them indirectly by removing supporting soil, which could cause the utility to bend or break. You could be injured or killed, and your company could be liable for any damages that occur. To avoid damaging buried utilities, do not use power-operated equipment within the tolerance zone. The law requires you hand dig, unless PG&E and the excavator have mutually agreed to the use of power-operated equipment, including vacuum excavation technology.